Feature packed and excellent value, the Live 802 is ideal for small live set-ups. Five mic inputs. Onboard Alesis DSP effects. Compact with sturdy construction. More flexibility in headphone routing. Channels feel a little cramped. Live 802 is an eight input, two buss mixing desk aimed at the live market, which means simpler routing options than a recording desk and a dedicated pre-fader monitoring path. At around 30x35cm and 8cm deep, it's super compact but feature packed, with stereo USB audio interface, onboard Alesis DSP multi-effects and nine-band graphic master EQ. Its eight inputs are spread across four mono channels and two stereo channels, with the fifth mic input sharing half of the 5/6 stereo channel. 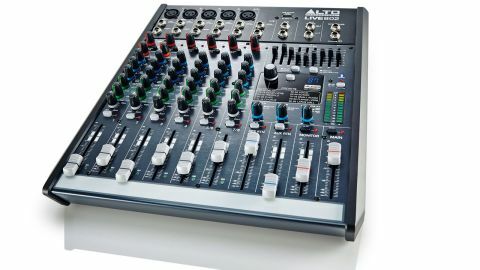 Conveniently, all channel input connectors are on the top panel, with 1/4-inch jacks (balanced and unbalanced) alongside mic input XLRs where appropriate. Channels one to four include TRS jack insert points. "Live 802 is well made and, although the channels feel a little cramped, overall it's very easy to use"
Common to all channels are 60mm faders, latching mutes with red LED, green signal LEDs, pan (balance on the stereo channels), three-band fixed frequency EQ and two auxiliary sends. The EQ delivers +/-15dB via 80Hz low-shelf, 2.5kHz mid-band bell and 12kHz high-shelf. Meanwhile, the first of the two sends is labelled Monitor and routes the pre-fader signal via its own 60mm monitor fader. The second send is post-fader and hard wired to the onboard Alesis DFX processor, with its own return fader (DFX RTN). Both sends are available as physical outputs on 1/4-inch jacks, and there's also a single stereo auxiliary return with its own fader (AUX RTN). The final fader is the main output. All mic inputs include a 75Hz low cut filter, with channels one and two including a one knob compressor. The back includes master outputs on XLR and 1/4-inch jack, plus a two-track recorder loop (input and output) on two RCA pairs. There's also a control room monitor output on 1/4-inch jacks and a regular three-pin mains input. The final connector is a USB type B for the audio interface. Live 802's output section includes a number of features. The Alesis DSP has 50 reverbs, 20 delays and 30 further effects (tremolo, rotary, chorus and flanger). Alas, these have no editable parameters but the effects sound good, and convenience is really the selling point. The nine-band graphic can be conveniently routed either to the main output or the monitor (send 1) output. Below the Alesis DSP are three level knobs with buttons - two-track recorder input, USB audio interface input and a combined headphone/control room output. The first two can be switched direct to the main output or to a 'cue' buss and, with a corresponding selector on the control room level, you can route them to your control room without impacting the main outputs. Rounding things off are global phantom power, headphone output, foot pedal jack input for bypassing effects, a dummy USB type A connector for charging devices, and an LED master output meter. Live 802 is well made and, although the channels feel a little cramped, overall it's very easy to use. The basic channel EQs are perfect for sculpting and, with their compressors, channels one and two make a perfectly usable front-end. Using the graphic EQ's bands in isolation reveals them to be quite narrow, nevertheless, when applied in typical sweetening shapes, it sounds pretty good. We did find the USB audio interface susceptible to computer interference - frustrating when trying to get a clean signal into your computer. Also, it would be nice to see a bit more flexibility in the headphone routing and maybe separate control room and headphone level controls. Even so, given the price, this is a surprisingly accomplished little mixer.